Avanti Printing is a top Digital Printing serving Orange County, California. Because we are centrally located in Irvine we can offer quick printing and free pickup and delivery. 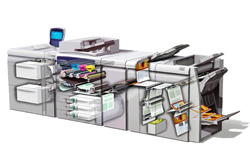 Utilizing our two digital presses, Xerox 1000 and HP Indigo, we can offer high quality digital printing, with same day or next day turnaround times. The Xerox 1000 gives a glossy look and the HP Indigo Press looks more matte similar to offset printing. Avanti Printing offers quick short run printing such as Business Cards, Postcards, Posters, Brochures, Newsletters, Catalogs, Booklets, Business Forms, Manuals, Books . We can also provide quick Graphic Design if you not only need quick printing but also need your business cards designed within a short time frame. We print quantities as low as a few color copies to 1,000 quick trifold brochures. Another feature of Digital Printing is the ability to print variable printed pieces. This means we can imprint a sequential number on your postcards, or imprint different customer names to better personalize your marketing piece. This has been known to return a higher response rate when your current or prospective clients receive your personalized postcard or newsletter. Avanti Printing can also mail out your pieces for you, getting the best postage rates available for bulk mail. See our Direct Mail Services page for more information.